Choose the fate of two worlds in this surreal adventure. Earthbound-y psychological horror RPG Omori was Kickstarted back in 2014, but that estimated 2015 release date has come and gone. If you're getting impatient, hopefully the news that it's still being worked on will reassure you—in fact, the developers say they've "gotten a lot done" in 2016. The protracted development is due, in part, to the engine being updated to RPG Maker MV, which has "broken a lot of our plug-ins, all of which have had to be remade". All of which is to say that it's not clear when Omori will release—but a new trailer has me looking forward to that mysterious date nonetheless. 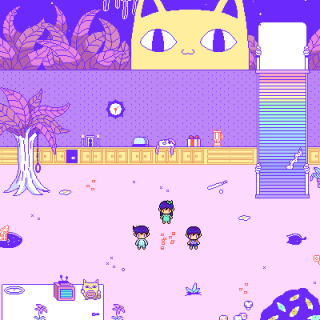 "OMORI is a surreal psychological horror RPGmaker game. You must travel between two worlds, both welcoming, both concealing the same secrets. Meet new (old) people, fight new (old) enemies, explore your own memories, and uncover some hidden truths along the way (although you wish you hadn't.) When the time comes, you can only choose one. "Which world is more real? You decide, I guess." There's a more detailed backstory to Omori here, and a two-year-old video that better illustrates the sort of game it is below.